As CEO of AAEA for thirty two years, Norris McDonald has been blessed with a wide variety of experiences. Staff and offices have shifted over the years. His personal and professional circumstances have also shifted over the past two decades. Marriage, divorce, birth, death, up, down and all around -- the ride for him and AAEA is not over yet. Fortunately, AAEA has provided many people with invaluable moments and hopefully we have made a difference. Below you will find important AAEA moments frozen in a snapshot, such as McDonald’s visit with Dr. Jackson, Gustave. A picture is worth a thousand words and we want to provide you with a limitless view. 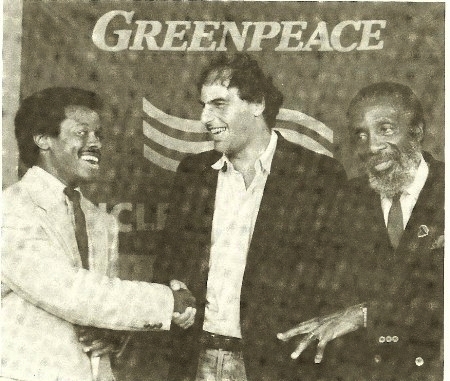 When McDonald worked for the Environmental Policy Center/Institute (now Friends of the Earth) -- 1979 -1985, he organized the first Energy Braintrust during the Congressional Black Caucus Weekend in 1981 for the late Congressman Mickey Leland. In 1987, AAEA sponsored a Capitol Hill event for the release of a toxic waste report by the United Church of Christ. The report, Toxic Waste and Race, was written by Benjamin Goldman and was one of the first reports of its kind in the 1980's. 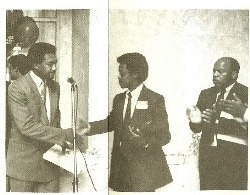 Pictured below at left, Norris McDonald presenting award to Benjamin Chavis (Congressman John Lewis is to the right). The middle picture includes 80's board members David Hahn Baker and Jannie Pittman. Also pictured are Ben Chavis, Congressman Howard Wolpe (D-MI) and former AAEA board member Bill Chandler (Batelle). The awards ceremony was moved into the foyer of the north wing of the Rayburn House Office Building because it was raining. The event was to be held in the courtyard of the Rayburn House Office Building (1987). Norris McDonald in the middle with Robert Redford kneeling to his right. Navajo Chairman Peterson Zah is at Redford's right (1984). AAEA Board member and consultant Derry Bigby and with housing inspector conducting and energy audit in Washington, D.C.
1) Sierra Club, 2) United Nations Environment Program, 3) Greenpeace, 4) Chesapeake Bay Program, 5) Maryland Governor's office 6) Environment & Energy Study Institute, 7) Scenic America, 8) American Lung Association, 9) Natural Resources Defense Council, 10) American Forestry Association, 11) Global Tomorrow Coalition, 12) Environmental Action Foundation, and 13) National Wildlife Federation. 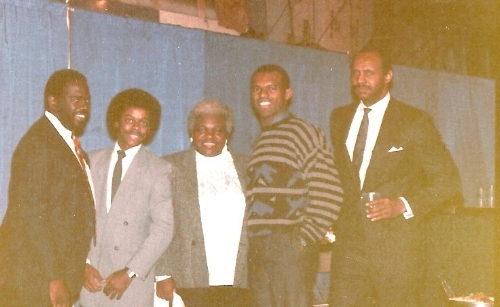 AAEA reception at Washington Bullets (now Wizards) game with Congressman Albert Wynn, Norris McDonald, Prince George's County member, Bullets point guard and AAEA board member Frank Johnson (1986-1990) and AAEA board member Derry Bigby backstage at the Capital Centre after a basketball game. 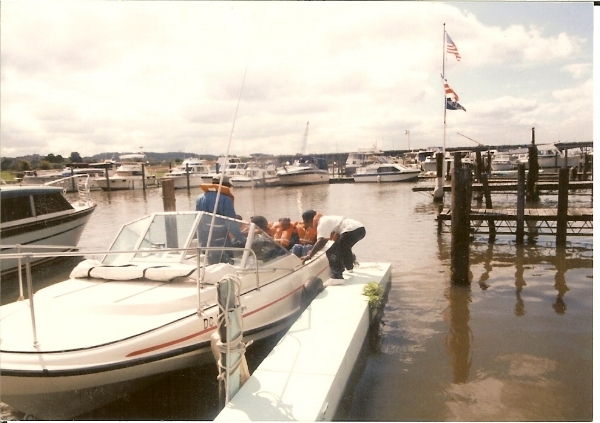 AAEA sponsored Anacostia and Potomac River tours in the 1990s. Our 22 foot Boston Whaler was docked at Seafarer's Yacht Club, the first African American boat club in the United States. AAEA President Norris McDonald is pictured releasing lines to begin the tour with inner city youth. Dr. Jackson, Gustave is standing in the middle of the boat. McDonald also piloted the boat on the tours. Dr. Jackson Gustave is a AAEA geologist. Norris McDonald at the helm. Kids are seated with life jackets on. Dr. Jackson stands at right. AAEA sponsored tours with EPA sponsored (Gore/Embeki Commission) river tours with representatives from South Africa. Speech at National Governors Association (NGA) Energy Forum in Wilmington, Delaware. Speech at Black and Puerto Rican Conference in San Juan, Puerto Rico. Attended National Worker Coop Conference at Millenium High School in New York. Panel Speaker for New York Affordable, Reliable Electricity Alliance at Energy Forum in Tarrytown, NY. Spoke on panel at NY AREA "Lower Hudson Energy Forum"
Met Bruce Willis at a National Fish & Wildlife Foundation event on Randall's Island in New York. Met Spike Lee at a book signing event in Washington, DC. Briefly discussed climate change and his planned documentary on New Orleans and Katrina. Established , L.A. Office website and Hollywood Blog. Attended signing of the Energy Policy Act of 2005 in Albuquerque, New Mexico. Attended L.A. Mayor Villarigosa Inauguration at City Hall and met Arnold Schwarzenegger, Cheech Marin, and Ed Begley, Jr. Interviewed by CBS. Toured San Onofre nuclear power plant near San Diego. Toured Grand Gulf nuclear power plant in Port Gibson, Mississippi. Testified before Nuclear Regulatory Commission in Port Gibson, Mississippi in support of Grand Gulf nuclear plant Early Site Permit. Spoke on panel at Queens, New York Energy Forum. WPFW 98.3 FM Pacifica Radio interview with Mike Tidwell, Director of Chesapeake Climate Action Network in Washington, DC. BBC Radio interview on the future of nuclear power in Germany. WVOX radio interview in New Rochelle, New York with Mt. Vernon Mayor Ernie Davis. Energy policy discussion. Attended the 7th Annual "Keepers of the Dream" Dinner and Awards Ceremony sponsored by Reverend Al Sharpton and the National Action Network in New York. Denzel Washington, Sean 'P. Diddy' Combs, Suzanne DePasse, and Spike Lee, among others were recognized. Conducted radio interview on the nation's only environmental radio station, WRYR 97.5 FM in Sherwood, Maryland. It is a 100 watt station seveing the Eastern and Western Shores of the Mid-Chesapeake Bay Region. Attended the 18th Annual New York State Assembly/Senate Puerto Rican/Hispanic Task Force Conference in Albany, NY sponsored by Assemblyman Jose R. Peralta -- panelist for Environmental Injustice Workshop. Visited Dominion's North Anna nuclear power plant near Mineral, Virginia. Toured Exelon's Clinton, Illinois nuclear power plant. Presented statement at Nuclear Regulatory Commission (NRC) Early Site Permit hearing in Clinton, Illinois. Testified on the Maryland Clean Cars Act before the Judicial Proceedings Committee of the Maryland Senate and the Environmental Matters Committee in the Maryland House of Delegates.. Testified on the Emissions of Four Pollutants From Power Plants Act before the Education, Health & Environmental Affairs Committee of the Maryland Senate and the Economic Matters Committee of the Maryland House of Delegates. Attended and commented at the Nuclear Regulatory Commission headquarters meeting on the Combined Operating License (COL) of Duke Power for considering two new plants near Charlotte, NC. Attendedthe 34th Annual Legislative Conference of the New York State Association of Black and Puerto Rican Legislatiors at Empire State Plaza in Albany, New York. As part of that conference, I attended the Environmental Health conference hosted by the W. Haywood Burns Environmental Education Center. Attended the Nuclear Regulatory Commission hearing on the Early Site Permit application for Dominion Power to build two new plants at its current North Anna power plant site. Spoke at a press conference in Baltimore with Maryland PIRG and others on the low-emission vehicle Clean Car Campaign. The hearing was held in Mineral, Virginia -- 80 miles South of Washington, DC. Spoke at the Maryland State Highway Administration's Black History Month speakers series. Testified at the Intercounty Connector hearing conducted by the U.S. Federal Highway Administration and the Maryland Department of Transportation. Spoke at the New York Urban League's Third Annual Rev Dr Martin Luther King, Jr. Symposium at the Schomburg Center in Harlem, New York. Spoke at the Black Enterprise magazine headquarters in New York on environmental and energy issues. Testified before the Army Corp of Engineers in Boston on the Draft Environmental Impact Statement in support of the Cape Wind energy project proposed for Nantucket Sound. Met with the President and Vice President of Cape Wind Energy at their office in Boston. Spoke on the environmental justice panel at the Society of Environmental Journalists annual conference in Pittsburgh. AAEA was invited by the White House to attend President Bush's acceptance speech at the Ronald Reagan Building. Met with with Jim Connaughton, Chairman of the White House Council on Environmental Quality. Met Ms. Ayanna King, Director Environmental Justice Institute. AAEA worked with New York City Council Charles Barron to get a New York City Environmental Justice Act introduced before the New York City Council. Met approximately 15 ministers in Harlem and assisted in the establishment of an environment committee. Played in a benefit golf tournament to help Fort Foote National Park in Prince George's County, Maryland. Worked out of AAEA's newly established New York Office located in the South Bronx. Looked at the numerous trash transfer stations, Hunts Point (produce delivery station), power plants and other industrial facilities. AAEA also commissioned a Southeastern Regional Office with Sulaiman Mahdi, who once ran the AAEA Georgia Office for the Southeastern Region. Visited each of 39 offices of the Congressional Black Caucus and met with either staff or a member at least once--in some cases 2, 3 or 4 times. Visits were to discuss energy and air legislation. Also discussed the Green Group Report Card. Presented testimony before the New York Westchester County Board of Legislators (County Council) in support of the Indian Point nuclear power plant. Attended the opening of the New York Affordable Reliable Electricity Alliance (NY AREA). Met with Rudy Giuliani, who is a security consultant for the owner of the plant. He provided opening comments at the meeting. Proposed environmental justice legislation at a meeting of Delegate Clarence Davis' Environmental Justice Committee at the Maryland Legislative Black Caucus 2003 Legislative Conference in Annapolis, Maryland. Attended Delegate Davis' follow-up meeting at Morgan State University in the President's Conference Room. The Environmental Justice Committee discussed the upcoming legislative session. Delegate Davis provided lunch. Played in the Congressional Black Caucus Spouses 11th Annual Education Scholarship Fund Golf & Tennis Tournament at Argyle Golf Course in Silver Spring, Maryland. Attended the Congressional Black Caucus Pre-Tournament Gala aboard the glass-topped cruise ship Odyssey on the Potomac River with entertainment by Kenny Lattimore and Regina Carter. The scholarship fund awarded more than $700,000 in 2003. Played in a golf tournament at Tantallon Country Club in Prince George's County, Maryland to support the restoration of Fort Foote National Park. Played in a golf tournament at Willow Ridge Country Club in Westchester County, New York sponsored by the African American Men of Westchester County to support their youth program. Met President Bush the same day at the White House for the first time.